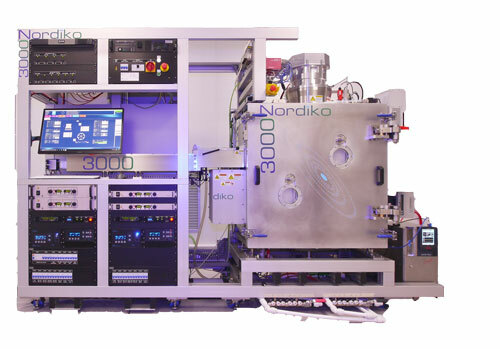 The 3000 is a multi-target dual source ion beam deposition system. The detailed implementation has recently been revised and the system benefits from our latest generation of broad ion beam sources and advanced accelerators. The configuration draws heavily of the original 3000 that we introduced more than twenty-five years ago. Assembled using our latest developments in sources, neutralisers, substrate tables, target carousel, motion control and automation systems the system provides a powerful capability for both metallisation and dielectric deposition applications. This configuration combines simplicity with innovation and is capable of delivering exceptional within wafer non-uniformity. The system is more compact than the 3400 and 3600 models. A key feature is that it can be used with substantially smaller targets. This can be a big advantage for laboratory applications and production uses where precious metal targets or other expensive materials are required. It may be configured without a vacuum load lock, with a simple linear high vacuum load lock or mated to a wafer handling platform with a cassette-to-cassette elevator load lock.